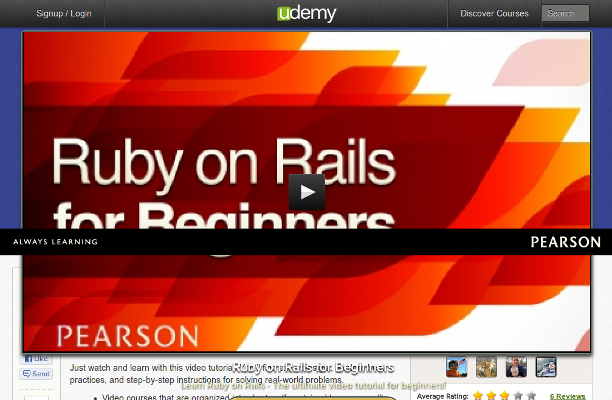 Best 6 Online Training Courses for Learning Ruby on Rails - Videos, Instructor led Tutorials. 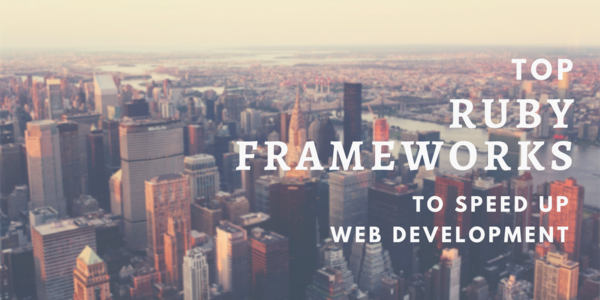 The main topics covered here are MVC, Git, CSS, Twitter Bootstrap, Ruby 1.9, Rails 3.2, TDD, BDD with Capybara and RSpec, deployment on Heroku, modeling users, sign up process, user micropost, following users, testing with Spork and Guard, and introduction to Cucumber and Gherkin. You can read the book online absolutely free but they charge you USD 26 for the downloadable version. You can also opt for the combo bundle of PDF-screencast by paying USD 125. 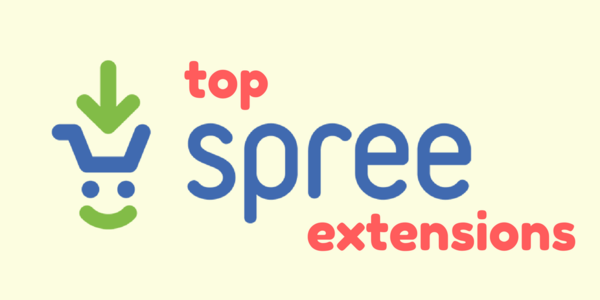 This further entitles you for few freebies like the copy of the 1st edition, screencasts for installation, advanced setup, and Sublime Text 2. 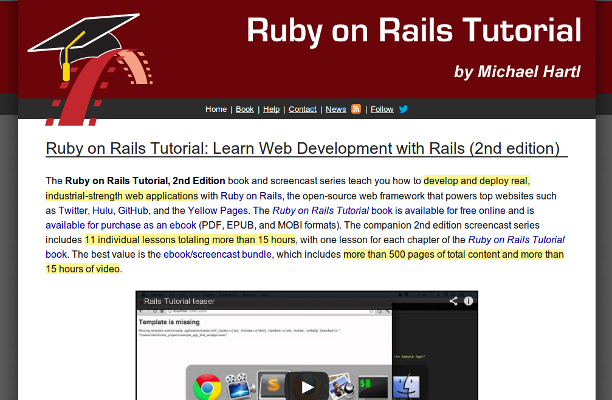 The three popular courses from Codeschool cover almost all the basic aspects related to Ruby and Ruby on Rails training with unique screencasts and exercises. Try Ruby lets you to practice and understand Ruby core concepts and language API. There are no videos in this course. 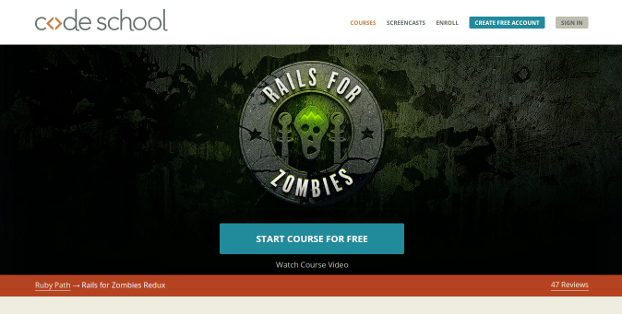 Zombies Redux trains you on how to work with database in Rails by using CRUD, using ActiveRecord, MVC concepts, controllers, and directing requests to your apps. Zombies is an advanced course and takes you through the actual process of developing a Rails app, database migration and configuration, Ruby 1.9 hash syntax, bundler, REST, SCSS, Coffeescript, and RESTful routing. You can opt for any of the courses depending upon your knowledge about programming and Ruby. Codeschool charges you a uniform fee of USD 25 per month in return to complete access to all its advanced courses. Being the basic ones, Codeschool offers the above three courses for free. Another great lecture-series by Michael Hartl, this course is spread over 75 lectures and more than 1140 minutes of content. The basic topics you learn here are MVC, REST, Ruby, Rails, caching, performance, testing, deployment, data modelling, layout, user microposts, updating/showing/deleting users, sign up process, security, building a Rails 3 app, messaging, RSS, social features, search, and refactoring. The course costs you USD 129 and you may also avail the benefits of guidance from an online instructor as and when required. The course comes in two parts. First part is very basic and includes a screencast summing up to 75 mins. The second part is a 90 mins video and takes you from basic to advanced concepts. 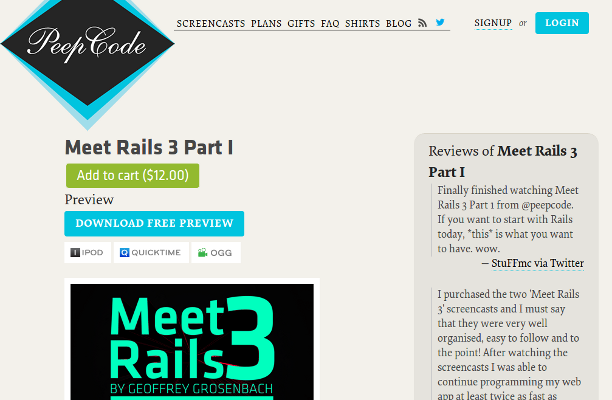 The first segment covers the basics of Ruby, Rails, directory organization, models, views, controllers, and Rails server. While the second one teaches about Git, helpers, model design and data, model relationship, REST, REST routing, and controllers. You can enroll for one or both the parts by paying USD 12 for each part. 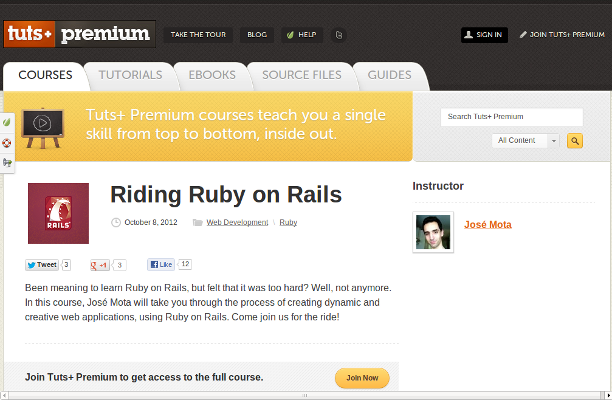 The course runs over 200 mins of video tutorials by Jose Mota and extensively covers Rails basics. It is divided into 4 different segments adding up to 18 chapters. 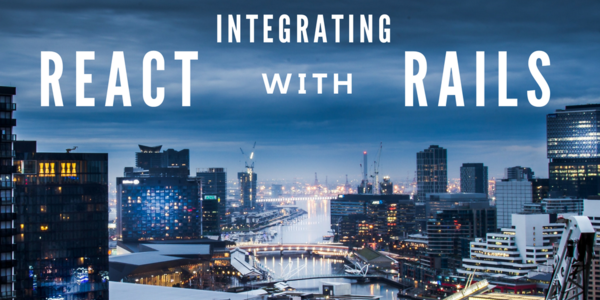 During the course, you will learn about Rails, model design and migration, model relationships, routing, asset pipeline, gemfile, validations, callbacks, view helpers, query interface, layouts, building resource scaffolds, email delivery through controllers, and content negotiation. 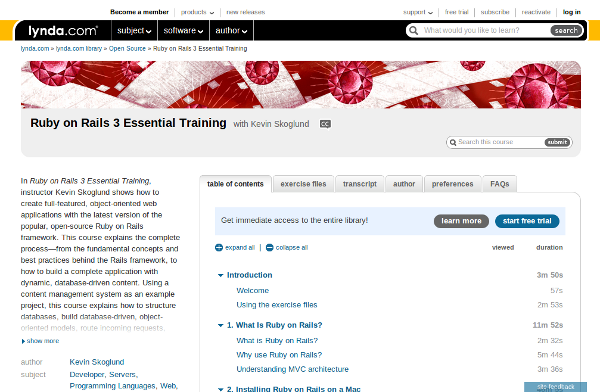 To take up this course, you have to be a paid member of tutsplus.com. The membership fee is USD 19 per month/USD 180 per year. 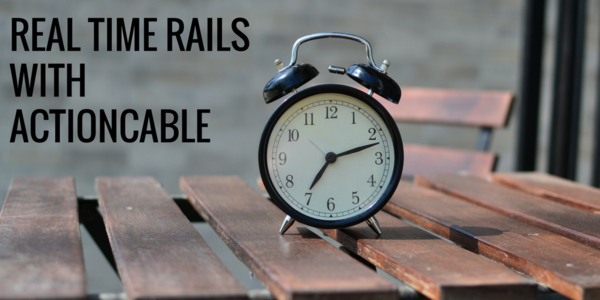 The 730 mins lecture series by Kevin Skoglund takes you through almost all the primary aspects of Ruby and Rails. The series is divided into 16 different segments with each one further divided into short video sessions. By taking up the course, you will get to learn about Ruby, Rails 3, database, migration, ActiveRelation, ActiveRecord, MVC architecture, layouts, forms, gemfile, views, CRUD, REST, controllers, models, view helpers, debugging, bundler, partials and error handling. To access the tutorials, you have to be a basic/premium member of Lynda. They charge you USD 25 and USD 37.50 per month for basic and premium memberships respectively. In return, what you get is a full-fledged access to more than 1700 courses running over 97,000+ video tutorials. Premium members also get an added benefit of downloading project files for free.